Redber is a coffee roastery based in Guildford, although for those of us not in the area they are widely available online – either through their own website or (as in this case) via Amazon. Their range is fairly extensive and reasonably priced, and after stumbling across this one in the Amazon coffee aisle I’m definitely keen to explore it further. 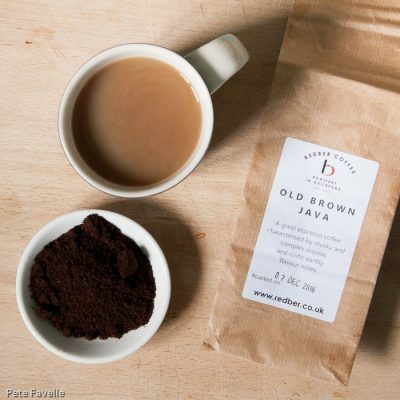 According to their website, Old Brown Java has its origins as ballast in European-bound ships in the 16th and 17th centuries and although that’s not the case now the beans are still weathered and aged for 2 to 7 years before being roasted – Old indeed! Old Brown Java Dark Roast is an Indonesian coffee; it’s offered in both a Dark and Medium-Dark roast which is something Redber seem to do across much of their range. I think this is an excellent idea, because everyone has different tastes when it comes to roast depth – and of course it gives you the opportunity to see how different roasts affect the same beans. The grounds have a rich, old wood aroma with a hint of wood smoke and a little sweet vanilla pod. Beneath that is just a touch of lemon acidity and perhaps darkest chocolate. Brewed, mustier notes appear – old polished furniture and tobacco; the acidity drops away, but there’s still a little sweetness present. In the mouth it’s rich and full bodied; earthy with some subtle woody spices and a nicely balancing sweet citrus acidity that’s gentle but lingers well. Delicious and incredibly moreish. Overall, I’m a big fan of this coffee; rich, smooth and easy drinking has me very keen to try out other coffees from Redber – 4.5 stars.